One of the pleasures of PhD work is the chance to browse in the dustier corners of the digital library. Lucas Seuren reports on finding books and articles which pack an remarkable punch, even many years after first publication. A few years ago, before I had started as a PhD student, I attended a few talks by Trevor Benjamin who at the time had just finished his dissertation on other-initiation of repair. During these talks he would point out that while conversation analytic research has developed much over the past few decades, there was still so much we did not know about what he called the ‘boring topics’. To clarify, he did not mean by this that topics such as his were actually boring, but that they may be perceived as such because they were dropped as subjects of investigation early on in the inception of CA. Recently I’ve started looking at one such subject: topical organization. Now there are obvious reasons for why conversation analysts have steered clear from topical organization. As Sacks noted in his lectures and as was explicated in more detail later on by Jefferson: topics tend to flow from one to the next, and so there are typically no clear boundaries between topics. And to paraphrase the third founding parent of CA: what is being talked about is hard to pinpoint and in fact usually less relevant than what talk is being used to do. Structure in interaction is achieved through sequences, not through topics. While reading Button and Casey’s papers, what struck me was how much has already been said about topical organization; it seems almost impossible to contribute anything meaningful. Might it be that researchers stay away from topics not just because topic is a problematic analytical tool, but also because there is simply little more to say? What I found particularly fascinating is how Button and Casey bring their findings together. At first glance it might seem like all they did was describe some practices participants use for doing boundaried topical movement: topic initial elicitors, itemized news enquiries, news announcements, and launching topics as business-at-hand. But they go beyond these observations, showing why these patterns arise: these practices are generic solutions to generic problems. The problems could be broadly described as (i) how to stay-in-conversation, particularly when the flow of topic has failed; and (ii) how to introduce a topic if prior talk may or does not warrant its introduction. One might wonder why participants come to the solutions that Button and Casey found. And here too they provide a simple and elegant answer. When launching a new topic where stepwise transition has failed, the topic will initially be speaker-oriented or recipient-oriented (as Sacks explains: it should become something for us). If a topic is speaker-oriented, the speaker can introduce it with a news announcement. If on the other hand it is recipient-oriented, the speaker can either provide the recipient with carte blanche by doing a topic initial elicitor, or s/he can nominate a particular topic by doing an itemized news enquiry. As for the second problem: by treating or even establishing a topic as known-in-advance, introducing it becomes not only legitimate but possibly even necessary. After reading these papers, I think I can make another recommendation in addition to the one Trevor proposed. Not only should we go back to the ‘boring’ topics because there still may be plenty to investigate, but there is also still much we can learn from them. The papers by Button and Casey (and related works by Sacks, Schegloff, and Jefferson) showed me where my research might contribute to CA, and they are beautiful examples of how conversation analytic research can be done and reported. While I would not go so far as to say that they demonstrate the only way or the best way to do conversation analysis, they can definitely sharpen our analytical senses. To end with a quote by Anita Pomerantz from her plenary during the International Academy for Conversation Analysis earlier this year. … and we should try to figure out what the bases are of patterns we find. Button, G. & Casey, N. (1984). Generating topic: the use of topic initial elicitors. In J. Heritage & J.M. Atkinson (eds. ), Structures of Social Action (pp. 167–190). Cambridge: Cambridge University Press. Button, G. & Casey, N. (1985). Topic Nomination and Topic Pursuit. Human Studies, 8(1): 3–55. Button, G. & Casey, N. (1988). Topic initiation: business-at-hand. 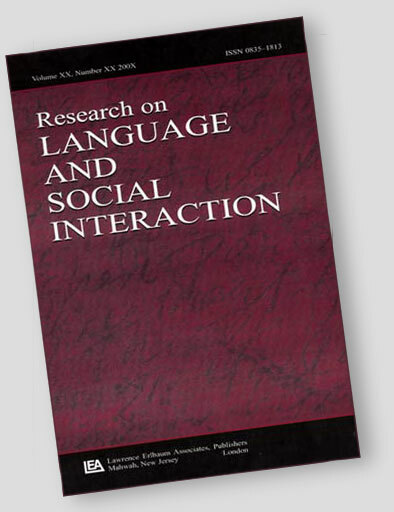 Research on Language and Social Interaction, 22(1-4): 61–91.